JJ Abrams has made a terrific movie. 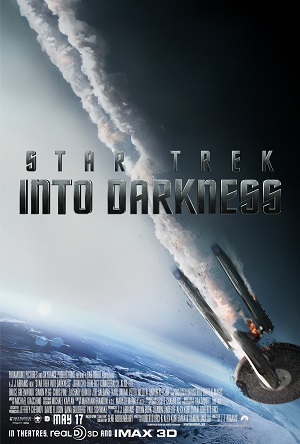 Despite the fact that I’ve seen all the ‘Star Trek’ movies, but seem unable to remember the plots of any of them…I loved this one. Maybe it’s because, at its core, it such a simple story: it’s the story of a friendship. Kirk (Chris Pine) and Spock (Zachary Quinto) aren’t just colleagues, they’re polar opposites, two guys who fly together, fight together, and in the end, love each other. There is just so much humanity, so much humility and humor in this film that I cared so much for the people that I clapped at the end. There are impressive computer effects in here, but the heart of this movie was not created in a computer, it was created by Pine and Quinto working with a well-written script and great chemistry. If you’ve ever been in a situation where you’ve had to say good-bye to a friend or other loved one – and you’ve tried to tell each other all that your relationship has meant in just a few words — there is a wonderful scene near the end, where Kirk and Spock are reaching out for each other as one is slipping away – that will bring personal memories stumbling back and tears to your eyes. This movie is ultimately not about another world and another time, it’s about our world and our time. It’s about what we know in our hearts but can’t always express in our words. Great movies can do that – and this one is extraordinary.